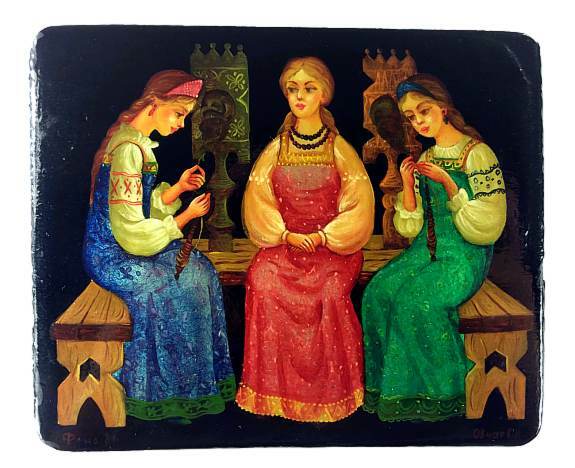 The three sisters are spinning the yarn and musing over what they would do had they been the Tsar's wife. The first one promises to cook a grand feast for the entire world, the second boasts that she would weave a beautiful carpet that would cover the entire world... The third one merely observes that she would bear the strongest and bravest son for the Tsar. Which of the promises will win the Tsar's heart? 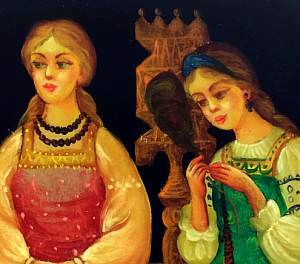 The painting is done in the traditional Fedoskino style: shimmering, bright blue, red, and green garments of the three sisters contrast beautifully against the black background of the box, and the wooden bench with spinning equipment looks quite realistic. The box is made from high quality papier mache. It sits flat (no legs) and has a hinge at the top. The interior is traditional red. The box is signed with the name of the artist, village, and year. The lacquer is somewhat grainy in places and chipped on the sides of the lid due to the age of the box.